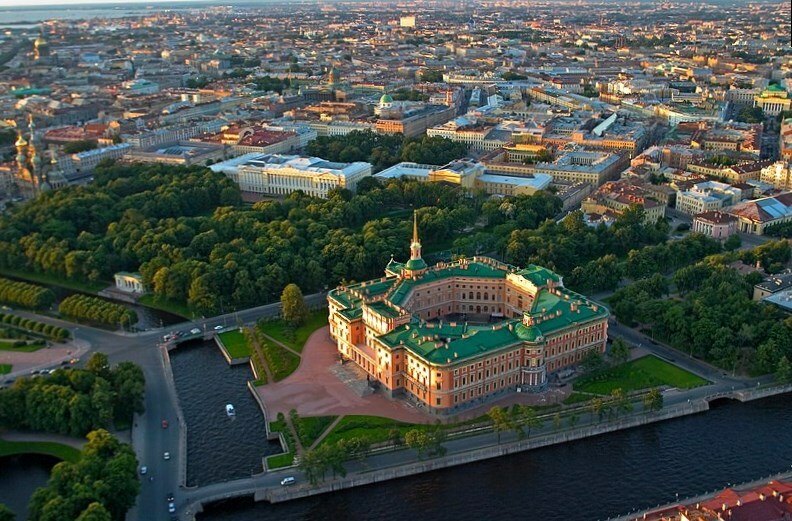 The Mikhailovsky (Engineers') Castle – is one of the most uncommon places of St. Petersburg with which a lot of legends and stories are connected. On this place, in the Summer Palace of Elizabeth of Russia, was born Pavel I. Here, in the bedchamber of Mikhailovsky Castle he was killed. They say his ghost still wandering here up to now. At first on-site of Mikhailovsky (St. Michael's) Castle there was the Summer Palace of Elizabeth of Russia constructed by the architect Bartolomeo Bartolomeo Francesco Rastrelli (1700-1771) in 1741-1744. On September 20, 1754 the future emperor Pavel was born here. In due course Elizabeth visited in the Summer palace more rare, giving the preference to Tsarskoe Selo. The palace was decaying. At first it was given to Gregory Orlov, then to Gregory Potemkin. In 1796 the Summer Palace was broken and on its place began the construction of castle. In accordance to one of the legends, the emperor, being a mystically disposed and having certain foresight person, wished to die where he was born. According to other legend, Michael the Archangel appeared to the soldier keeping a look-out. Michael the Archangel said to the standing dumbfounded soldier that he, Michael the Archangel , orders him to go to the emperor and tell that on the place of this old Summer palace was constructed the temple for the name of Michael the Archangel. The soldier informed the command about his vision and when they reported the emperor, he answered: "I already know the desire of Michael the Archangel; his volition will be executed". Hereupon he disposed about the construction of a new palace wherein the church for the name of Michael the Archangel should be constructed, and the palace itself was ordered to call the Mikhailovsky (St. Michael's) Castle". Vasily Ivanovich Bazhenov (1737 or 1738 - 1799) was an architect of this project. Pavel personally featured several drawings of the future palace. Construction was conducted with posthaste. Works continue unabated twenty-four-hour. During hours of darkness builder's yard was lit with torch-light and fires-light. There were from 2500 to 6000 people daily engaged at construction, apart from supervisors and masters. 791.200 rubles were earmarked at a time and 1.173.871, 10 rubles within three years. Lyg ( the Field of Mars) – triangular. Only the members of an imperial surname and envoys were permitted to drive to the main yard through Resurrection Gates. All facades of the Mikhailovsky Castle are different. According to the legend, reddish color in which were painted the walls was chosen not coincidentally. At one of balls the maid of honor, future favourite Anna Gagarina (Lopukhina) dropped a glove of such color, the emperor cocked it and, having admired a color, sent to the originator of paints as a sample. According to other version, this is the color of Malthusian Order (Pavel was a Great master of Malthusian Order). On the main eaves the inscription is beaten out: «Domu tvoemu podobaet" svyatynya Gospodnya v" dolgotu dnej». According a legend, the emperor was foretold that he will live so many years, how many letters are in this inscription. So this also happened – the emperor died on the 47th year of life. Pavel literally fell in love with his castle. When the empress Maria Fiodorovna gave him as a gift a service with types of the Mikhailovsky Castle, he shed a few tears. However the emperor lived here absolutely not for long – only 40 days. In the early hours of 12-th of March, 1801 he was killed by conspirators, in the bedroom of Mikhailovsky Castle. After Pavel's death almost all jewelry was taken off from the Mikhailovsky Castle. Internal finishing was kept only in the Throne-room and in the Round room; in some rooms on ceilings picturesque plafonds were remained. The various institutions were placed inside: gendarme half-squadron of leyb-guard, institute of blind people, committee on a charitable part, ministerial office of spiritual affairs and enlightenment. In 1820 according to the project of the architect Karl of Russia the territory around the castle was re-planned, ditches were filled up, and drawbridges were cleaned. In 1822 it was renamed into Engineers' Castle. In 1823 the Main engineering school (nowadays Military engineering and technical technical university) was placed here. Before the Mikhailovsky Castle was surrounded by a wall. From Bolshaya Sadovaya Street to the castle there were three lime and birch avenues that were got in during the lifetime of Anna Ioannovna. In front of the castle the big parade-ground — Konnetabl’skij was layed out. Here, at the Mikhailovsky Castle was established the monument to Peter the First. Below there was a signature: "To the great-grandfather from great-grandson 1800". This monument has a long story. Its initial idea belonged to Anna Ioannovna. It was supposed toconstruct on Vasilyevsky Island, in the place where there is a university now. It was casted by the founder Martilli on Rastrelli's project in Elizabeth Petrovna's reign. During the reign of Catherine the Great the monument was under a hovel on the bank of Neva at Isaakiyevsky Bridge. If you look closer at a monument, you'll see strangeness – one leg of a horse is a human's leg. At the same time in numerous pictures and lithographs horse’s leg are represented as normal. Bas-reliefs on a pedestal are nipped to gloss — it is considered that it brings luck. In the Soviet times in the castle were placed various institutions, in blockade — a hospital. As a result of alterations painting on walls and ceilings was covered, halls were partitioned. In 1991 and 1995 the Mikhailovsky Castle at first partially and then completely was transferred to the Russian Museum. During reconstruction the interiors, inscription on a facade, statues were restored from the Summer garden, fragments of the Voskresensky channel and Trekhproletny Bridge were restored too. On 27-th of May, 2003 was held the ceremonial opening of the Mikhailovsky Castle. Now constant expositions are placed in halls: "Antique plots in Russian art", "Renaissance in works of Russian artists", "History of the castle and its inhabitants" and "Public foundation of sculpture".